Bill – I have people in my network who will unlikely ever become clients of mine. How do I use your concepts to engage with them for introductions? This is a question recently submitted from one of our Cates Academy members. Can you relate? 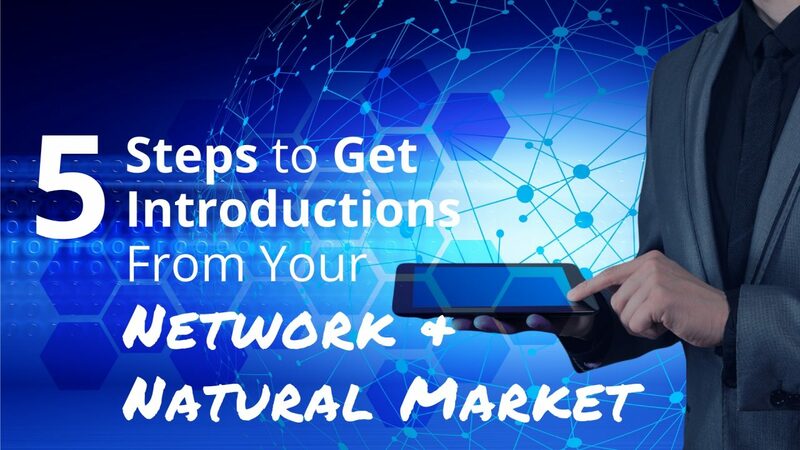 We all have people in our network (natural market) who may be perfectly willing and able to provide great introductions. This article covers my answer to that question. No need to be secretive or bashful. Let them know you could use their help in bringing your value to others. I’m making a concerted effort to work with more business owners in your industry. I would really value your opinion on how to go about that. Remember – Asking for help (specially to help others with your value) is a sign of high self-esteem. Schedule plenty of time to make sure they understand your value – what you do for people/businesses. You must be referable in their eyes. Demonstrate your full process and how you bring value to your clients in all phases of your relationship (with prospects, brand-new clients, and ongoing clients). George – What else do you need to know about the work that I do to help you feel most comfortable in providing me with introductions? Unless you’re willing to talk to and/or take on clients who aren’t ideal for you (and you probably shouldn’t), teach these folks about your ideal clients – who you serve the best. George – I’m not the right advisor for everyone. Let me describe some of the attributes of the folks we serve the best – the folks for whom our processes are designed. Don’t make the classic mistake of asking, “Who do you know who I can help?” Don’t throw open the entire universe for them to visualize. Help them visualize individuals or small groups. If you can identify specific people you know that they know, ask for specific introductions. If not, suggest categories and generally brainstorm with them. George – I know you know Laura Smith. Can we come up with an approach for you to introduce me to Laura that will feel comfortable to everyone and, at least, peak her interest in hearing from me? Don’t settle for weak word of mouth. Make sure you get as strong of an introduction as possible. Leverage the trust between your referral source and the new prospect. “Laura, meet Bill Cates. He has helped me get super clear about some critical business strategies and has helped me refine my value proposition that is helping me attract just the right clients. Are you open to doing something like that? If so, let’s figure out what you might want to say to Laura to peak her interest in hearing from me. To summarize… Make sure you are referable. Be clear about who you want to meet. Secure a solid introduction. What do you do in this situation? What questions do you have?